Pittsburgh and elsewhere to improve his properties – and watches for the same red flags that he steered clear of in his early years. Those warning signs are listed below. Never work with a contractor who can’t show you their permits, licenses, and insurance papers. Each state has different regulations regarding the licenses contractors should have before beginning work on a project; make sure your applicants meet all of the proper requirements before you hire! Asks to work without a contract. If they don’t sign a contract, they don’t get the job. Never trust a contractor who offers to take on the remodel with only an informal verbal agreement; without the proper documentation, they can exit the job at any time and leave you with no money and a half-finished project. For advice on what to put in a contract, check out HomeLogic’s post on Contract Basics. Offers to work at an unreasonably low rate. Don’t trust a lowball offer, especially if the contractor asks to be paid upfront or in cash. Some shady operators will lead with a low initial cost, then demand more money from the homeowner later, citing a budgetary miscalculation. 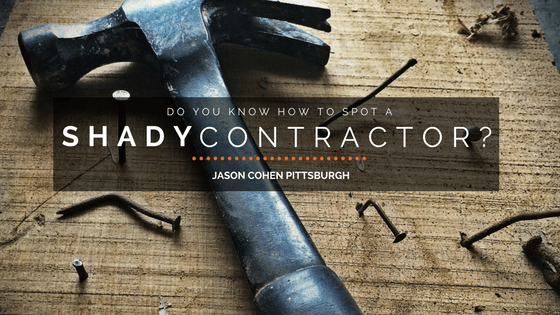 Don’t be fooled by contractor scams – go with someone who offers quality work at a reasonable price. Avoid hacks! Make sure that your applicants have the proper equipment to complete the job at hand. A lack of necessary equipment indicates a lack of experience and skill, and hiring an under-qualified contractor will cost you in time and money. If you’re unsure of a contractor’s competency, reach out to their references! They might provide you with insight into the types of jobs that your applicant has worked before, and whether the contractor is right for your project. Your remodel is important to you, and any contractor should be aware of its value. Find someone that you can work well with; someone you trust to listen to what you need from the project. Odds are, you’ll be working with this person for weeks or months – so don’t go with someone who brushes away your concerns, skips meetings, or acts rudely!